Thirteen candidates have put themselves forward for the position. The more conservative elements in the NSW branch are backing Justin Field, a former parliamentary staffer who currently works at the NSW Conservation Council. He has been strongly backed by NSW upper house MP Jeremy Buckingham, who is often at odds with the more left-wing NSW Greens branch. He is the only NSW Greens MP to join the NSW Parliamentary Friends of Israel, and has denounced support for the BDS campaign. Despite the fact that decisions made at NSW Greens State Delegates Committee (SDC) meetings are meant to be binding on MPs, Buckingham has publicly spoken against NSW Greens’ policy. One of the left pre-selection candidates, Tamara Ryan, has specifically raised the problem of MPs ignoring the SDC decisions. Five of the left-wing candidates are exchanging preferences to try to ensure that the left vote is not split so that Field could get elected. In response, Buckingham took to his Facebook page to release a video condemning “factionalism and group voting tickets”. But the accusations of “factionalism” are just hypocrisy. While former leader Bob Brown backed Jeremy Buckingham’s attack on “factionalism” in the NSW pre-selection, he used the national media to denounce the NSW Greens and to intervene in the pre-selection fight. Brown has given interviews to The Guardian, The Monthly and ABC’s 7.30 where he declared, “They need a clean out in NSW”. He called for NSW Senator Lee Rhiannon to stand down, blaming her and the left-wing leadership of the NSW Greens for disappointing federal election results, saying NSW is being “held back by the old guard”. The Greens’ electoral results in inner city Melbourne seats, where they recorded significant improvements, are being held up as a model in order to criticise the party’s performance in NSW. The Greens’ campaign model in Melbourne was based on a single-minded electoralism, based on door-knocking, calling voters for months in advance of the election and tailoring election messages in each electorate to maximise votes. This kind of approach comes at the expense of any serious effort to build social movements and is dragging The Greens to the right. NSW is the most left-wing Greens’ state branch. In the past NSW delegates have clashed with other parts of the national party over issues like funding for private schools and their call for the party leader to be elected by the membership. But the NSW preselection shows the lack of serious organisation by the left inside the NSW Greens. Rival left candidates are running against each other, whereas the conservative grouping has been able to come behind a single candidate. The left needs to be organised if it is going to effectively fight the right of the party. John Kaye was amongst the most principled and left-wing of The Greens’ MPs. In a final message to Greens members he argued that, “the critical outcome for the Greens is to not be caught into parliamentarianism …” Fighting neo-liberalism and addressing the climate crisis, “can only be grown by the work we do, not as an aspiring opposition, but as an aspiring agent of social change”, he said. But even among the left preselection candidates, the prime focus has been on parliamentary representation. 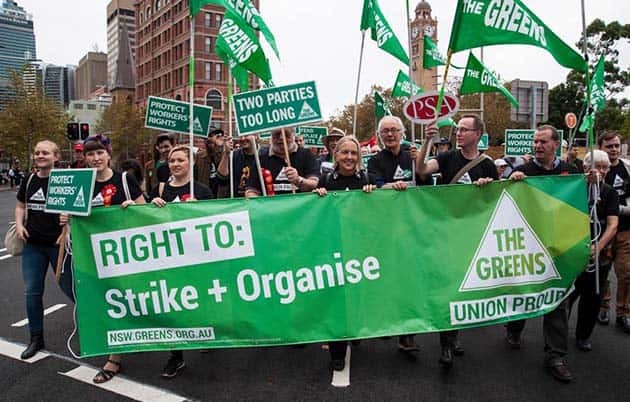 Leading figures in the NSW Greens acknowledge the importance of movements outside parliament. But they see them as a supplementary force that The Greens work and gain support from, instead of recognising that it is movements outside parliament that drive and win social change. Even in NSW, running in elections and work in parliament makes up most of what The Greens do. Greens leader Richard Di Natale has not directly involved himself in the NSW dispute but has admitted that he wants to take the party in a more pragmatic direction. And Bob Brown is a stalking horse for taking the party further to the right. Encouragingly, hundreds of Greens members have signed a letter rejecting Bob Brown’s intervention in the NSW party. Everyone on the left has an interest in ensuring that the right’s candidate, Justin Field, is rejected. But the question of what sort of party The Greens should be is still unresolved. Becoming a clearly left-wing party depends on relating to the working class and building movements outside of parliament, not electoralism focused on winning more MPs.